nu-folk trio Haim have just announced their North American Tour. For the second night in a row they will be performing at The Wiltern! They will be performing in support of the critically acclaimed album 'Days Are Gone'. Haims live shows provide a warm, upbeat and unique feel to the genre, the Los Angeles Times recently proclaiming “there’s probably not a cooler band in America right now” and FADER declaring that the band’s “practiced live show easily rivals any of their peers.” So what are you waiting for, head down to the iconic Wiltern on August 8th, tickets available now! 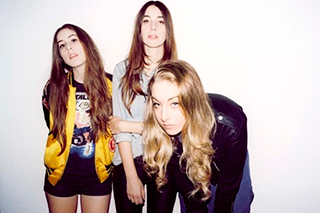 Haim are an American R&B, Nu Folk rock group consisting of sisters Este Arielle, Danielle Sari and Alana Mychal Haim. The beautiful trio grew up together in the California's San Fernando Valley, crafting thier own unique sound by playing small venues, influenced heavily by Beatles, Santana, Fleetwood Mac and Joni Mitchell. After playing at the South by Southwest Festival the group landed a record deal with Polydor. The latest album Days are Gone was recored with producers Ariel Rechtshaid and James Ford. Touring in support of their latest album, which is critically acclaimed. Expect to hear hit songs:“Falling,” “Forever,” “Don’t Save Me,” and “The Wire,” as well as title track, “Days Are Gone,”. It's going to be a blast! See you there!